Home / Emergency Fund / Are You Prepared for an Emergency? Right now, many people across the United States find themselves snowed in. I’ve been fortunate; even though we’re getting snow, it’s not really out of the ordinary for my region, and it’s not causing serious problems. I live in a mountain valley in the west, so we don’t have ice storms and wet snow. We still have our power, which is something that my husband’s relatives can’t claim right now. When these types of weather events interrupt our lives, it’s a good time to think about how prepared we are for emergencies. With traffic snarled for miles, you might not be able to get to the store to get food or extra water. With the power out, you may be without light. You might even be without heat. When you see images of frantic consumers raiding store shelves, one of the things missing most often is water. We all need water, whether it’s for cooking or washing or drinking. I store old containers of water in my crawl space, out of the light, for serious emergencies. We also have purification tablets and bleach so that the water can be used for washing and some cooking. I also have bottled water for drinking. Storing food is also a good idea. We store things that we are likely to eat, and that are easy to prepare. This includes pasta and sauce, chili, nuts, dried fruit, and frozen vegetables. Rotate through your supply so that the food doesn’t go bad. We usually eat part of our food storage in the regular course of meal planning, but we replace the used items with new items during a weekly shopping trip. If you don’t have room for months of storage, at least try to get a week or two stored up so that you aren’t one of the thousands clogging the roadways and frantically trying to get what you need when the emergency is imminent. We have several First Aid kits. We have our biggest and most complete kit here in the house. But we also have smaller kits in our cars, as well as in our 72-hour kits. Other supplies are those that you might find in your home every day, such as blankets and extra clothes. We also like to keep flares on hand, as well as a hand-crank radio and hand-crank flashlights. That way electricity and batteries aren’t necessary. You can also buy hand-crank chargers for your phones and other devices. And, as a last resort, we also have candles and an oil lamp (make sure you keep the oil fresh and the wick in good order). We have a camp stove, a hibachi, and a regular grill, and the gas to run them, for cooking in a pinch. And we also have an indoor-rated propane generator for heat. These items can be very helpful for heat when you don’t have other sources. Another emergency preparedness tip is to always keep your car gas tanks at least half full. That way, you aren’t at the mercy of long lines at the gas station. You can (hopefully) clear the population center before you need to get gas. 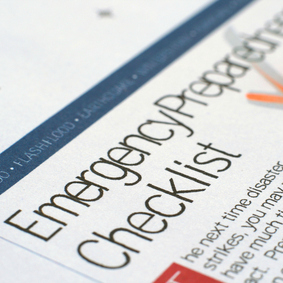 With a little preparation, you can ensure that that you aren’t caught by surprise, no matter the emergency. What are your tips? Are you in the middle of a blustery emergency? What have you done to prepare? Leave a comment!